Cairo: A new government, headed by former oil minister Sharif Esmail, was unveiled in Egypt on Saturday, a week after corruption accusations prompted the resignation of the previous cabinet. 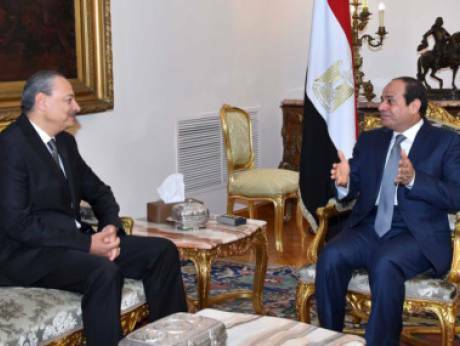 The new government took the oath of office in front of President Abdul Fattah Al Sissi in the early hours of the morning at the Ittihadiya presidential palace in Cairo. Ministers of defence, the interior, foreign affairs, justice, investment and finance, among others in the previous government, have retained their posts in the new cabinet. It features 16 newcomers, including Ahmad Zaki Badr, who has been named the minister of local development. Badr, a university professor, had served as education minister until the 2011 uprising, which forced long-time president Husny Mubarak to step down. The number of portfolios in the Esmail cabinet, has been reduced to 33 against 36 in the government of his predecessor Ebrahim Mehleb, as a result of merging some ministries. In the new cabinet line-up, the ministries of higher education and scientific research are incorporated into one ministry. The same has happened for the ministries of health and population and those of education and technical education. The cabinet also includes three women. Sahar Nasr has been appointed minister of international cooperation; Ghada Adel as minister of social solidarity; and Nabila Makram for the newly created Ministry of Migration and Egyptian Expatriates. The government will remain office for around three months until a new parliament is elected. Under a 2014 constitution, the legislature, Egypt’s first in more than three years, will have a say in forming governments. The Mehleb government resigned last week, days after the sacking and arrest of its agriculture minister, Salah Helal, who is facing graft charges. The local media claimed that other members of that government were also implicated in corruption. Al Sissi Saturday swore in Judge Nabil Sadeq, who was named the country’s prosecutor-general. Sadeq, the deputy chief of Egypt’s top appeals court, replaces in the post Hesham Barakat, who was assassinated in a car bomb in Cairo on June 29. Barakat was Egypt’s highest profile official to be killed in a wave of militant attacks that has hit the country since the army’s 2013 overthrow of Islamist president Mohammad Mursi following enormous street protests against his one-year rule.